El picaflor gigante (Patagona gigas) es una especie de ave apodiforme de la familia Trochilidae, y única representante del género Patagonas. 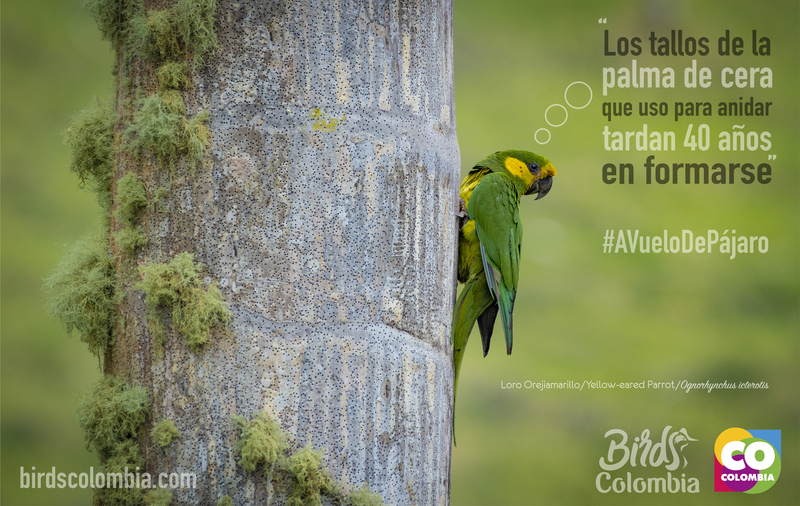 Es el colibrí más grande del mundo, de un poco más de 18 cm. Tiene un cuerpo alargado y cola ahorquillada. Es de color marrón claro con la parte inferior de color blanco. Se le reconoce por su forma de volar, más lenta que la de otros colibríes y que recuerda a una golondrina. P. g. gigas – Centro y sur de Chile hasta el centrooeste de Argentina. P. g. peruviana – Cordillera de los Andes del suroeste Colombia hasta el noroeste de Argentina y el norte de Chile. Vive en América del Sur desde Argentina y Chile hasta Colombia, entre el nivel del mar y los 1500 msnm, en el Perú habitan incluso hasta los 3500 msnm. The giant hummingbird (Patagona gigas) is the only member of the genus Patagona and the largest member of the hummingbird family, weighing 18–24 g (0.63–0.85 oz) and having a wingspan of approximately 21.5 cm (8.5 in) and length of 23 cm (9.1 in). This is approximately the same length as a European starling or a northern cardinal, though the giant hummingbird is considerably lighter because it has a slender build and long bill, making the body a smaller proportion of the total length. This weight is almost twice that of the next heaviest hummingbird species[ and ten times that of the smallest, the bee hummingbird. In Bolivia, the giant hummingbird is known in Quechua as burro q’enti, the Spanish word burro referring to its dull plumage. Members of P. gigas can be identified by their large size and characteristics such as the presence of an eye-ring, straight bill longer than the head, dull colouration, very long wings (approaching the tail tip when stowed), long and moderately forked tail,[ tarsi feathered to the toes and large, sturdy feet. There is no difference between the sexes. Juveniles have small corrugations on the lateral beak culmen. Two subspecies, P. gigas gigas and P. gigas peruviana, are recognised. These subspecies are thought to have emerged as a result of partial geographical separation of populations by volcanic activity in the Andes predating the Miocene; however, there remain areas of contact between the species, hence the lack of full speciation. [ The proposed phylogenetic system for hummingbirds suggested by McGuire et al. (2009) accommodates the possible elevation of these subspecies to species rank. 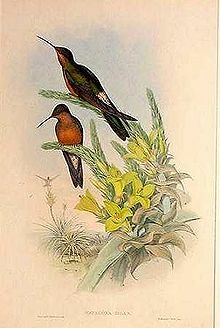 The giant hummingbird is widely distributed throughout the length of the Andes on both the east and west sides. P. gigas typically inhabit the higher altitude scrubland and forests that line the slopes of the Andes during the summer and then retreat to similar, lower altitude habitats in winter months. [ The species persists through a large altitude range, with specimens retrieved from sea level up to 4600 m. They have shown to be fairly resilient to urbanisation and agricultural activities; however, the removal of vegetation limits their distribution in dense city areas and industrial zones. P. g. peruviana occurs from Ecuador to the southeastern mountains of Peru and P. g. gigas from northern Bolivia and Chile to Argentina. Contact between subspecies is most likely to occur around the eastern slopes of the north Peruvian Andes. P. gigas regularly feeds from the flowers of the genus Puya in Chile, with which it enjoys a symbiotic relationship, trading pollination for food. [ As a large hovering bird, particularly at high altitudes, P. gigas has extremely high metabolic requirements. It is known to feed from columnar cacti, including Oreocereus celsianus and Echinopsis atacamensis ssp. pasacana, and Salvia haenkei. We do not know the exact scope of its diet, but inferring from the large amount of nectar required to be routinely ingested by such a large hummingbird, it is safe to say it is a generalist out of necessity: the more different flowers it will feed from, the more efficiently it can collect energy. P. gigas migrates in summer to the temperate areas of South America, reaching as low as 44° S. Correspondingly, it migrates north to more tropical climates in winter (March–August), though not usually venturing higher than 28° S.
P. gigas holds significant value for some of the aboriginal inhabitants of the Andes. The people of Chiloé Island believe that if a woman captures a hummingbird then they will gain great fertility from it. [ This is also the species that inspired the people of the Mapuche territory of Chile to create the Nazca hummingbird geoglyph.